There are three key industries that rely on corn: biofuel/ethanol, pork and fructose corn syrup. However, erratic corn prices are forcing biofuel and ethanol producers to diversify, and most are moving to lower-cost non-food and food feedstocks, such as waste vegetable oil, tallow, algae, waste sugar, corn cobs, wood waste and swtichgrass. This means that some production plants have underwent modifications in order to use these other feedstocks, and while that can be pricey, it has certainly paid off. The biofuel manufacturer FutureFuel has seen considerable gains since introducing alternative feedstocks: in 2011, the company’s biofuel revenue was $141.6 million; in 2012, the company increased this revenue by 35% to $191.4 million. Last year’s drought yielded a low corn harvest and was detrimental to ethanol manufacturers, who had to downsize production for the first time in 16 years. This year’s harvest is looking to be better, but ethanol and biofuel companies might opt for cheaper feedstocks instead. This shift is bound to have a significant impact on the corn industry, and we are likely to see an supply of corn that the pork and fructose corn syrup industries can’t cover. We will probably also see noticeably decreased prices, which will, in turn, put more pressure on corn farmers to increase prices to make up for last year and future losses. This a a true example of classic economic theory at play, where “supply and demand”, along with substitution in competing markets, affects commodity prices in a somewhat unpredictable manner. Like our previous post on rising milk prices, wheat prices, too, are on the rise; and this past summer’s drought is to blame. Pricing on corn and soybean skyrocketed to new records after this past summer, as the drought devastated massive amounts of both crops. Due to continued low rain- and snow-fall, many traders are betting that major increases on wheat prices will, again, occur during the next wheat harvest. Last week, the NOAA confirmed that 2012 was indeed the hottest year on record. 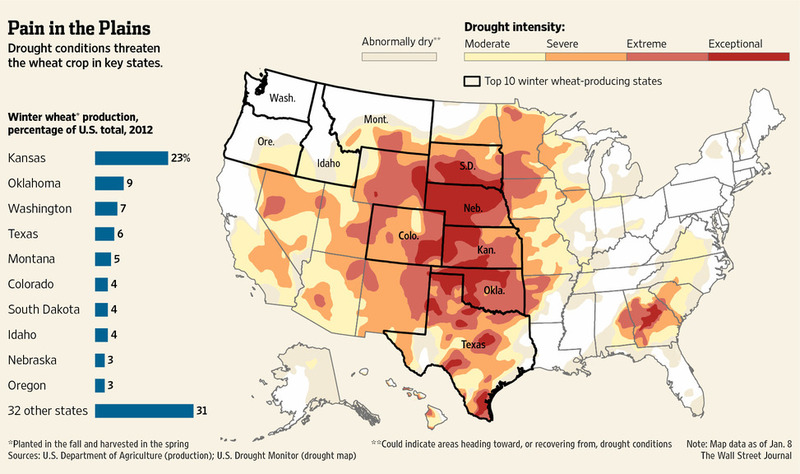 Kansas, the largest producer of wheat, and the southern area of the US called The Great Plains, are still plagued with drought conditions; since summer, soil moisture has greatly diminished, which is a necessity for healthy wheat-crop growth. And recent weather forecasts are not raising hopes. Wheat prices have increased by 5.1% since the USDA reported that quantities of wheat are less than expected. Traders trust that wheat prices have reached the bottom of the well; however, a continued poor harvest for the US, the largest manufacturer of wheat in the world, could further constrict supplies. A recent survey by the USDA shows that 26% of this year’s wheat crops are “poor” or “very poor”, suggesting that much cannot be reaped from these crops. The drought has been disheartening for farmers, causing some to plant less wheat this past fall. Additionally, due to low supplies of corn, a main ingredient in animal feed, farmers are going to use more wheat in their animal feed this year. Both of these issues could very well cause a further tightening on an already dwindling wheat supply. Russia and Australia, two main producers of wheat, have also been undergoing harsh droughts and yielding damaged crops. If record-high springtime temperatures continue, then rain will be a large necessity come March. Major wheat-producing countries are in dire need of some favorable weather this harvest season. Nobody can control weather and drought, but we can influence factors which affect weather and climate, especially if they are effected by human actions. It takes a long time to influence climate; therefore, we need to start now on meaningful climate change policy initiatives. It’s not about ideology, it’s about dollars, cents and wheat prices.